England’s top flight has always possessed some wonderful goal-getters who are fit to grace any division in world football. From the likes of Kevin Phillips, Jurgen Klinsmann and Les Ferdinand to the more modern day greats in the form of Thierry Henry, Didier Drogba and Wayne Rooney, English football fans really have been spoilt over the years. Of course any side needs a lethal frontman in their ranks and in a football climate where different styles and approaches to the art of being a striker are welcome, English football’s main division has seen all types of goal machines; from your traditional target man, to a fox in the box, the vast array of quality forwards rivals that from other foreign leagues. Below is a list of legends who have popped up over the years and cemented themselves into Premier League folklore. Here’s hoping this selection will have you reminiscing about the good old days - the list could have been endless! The little Italian magician, Gianfranco Zola, is one of the greatest players to wear a Chelsea shirt. Currently part of the Blues’ setup assisting manager Maurizio Sarri, Zola was not only known for his goals but his all-round ability on the ball. From flicks and tricks to blistering long range strikes, Zola was unplayable on his day. The forward signed from Parma was crowned the Football Writers’ Player of the Year in 1997 and won two FA Cups, the League Cup and the Cup Winners’ Cup during his seven years at Stamford Bridge. Oh how the current Chelsea side, who are priced at 11/4 (bet365) to finish in the top four this season, could do with someone like Zola now. An Arsenal legend, Ian Wright didn’t do a whole lot wrong during his time at the Gunners. Different to the likes of Aubameyang and Lacazette who are part of the modern day Arsenal - a team currently priced at 5/1 (bet365) to win the Europa League and 4/9 to finish in the top four, with various offers and promotions available from online bookmakers - Wright ended his career in north London by delivering a Premier League trophy aged 34. He scored 185 goals in 288 appearances for Arsenal and is the club’s second highest goalscorer of all time behind a certain Thierry Henry. Possibly one of greatest ever finishers English football has seen, Robbie Fowler was one of a kind. Playing for the likes of Liverpool and Leeds, Fowler was an assassin in front of goal with his deadly left foot slaying countless opponents. A local Liverpool boy, the Reds’ fans formed such an affinity with Fowler that they nicknamed their Toxteth-born goal machine ‘God’. Sadly, though, Fowler tends to be forgotten by many outside of Anfield as injuries disrupted what could have been an even better career. He’s still held in high regard though and will be hoping to see Liverpool lift the Premier League trophy this season, a feat they’re so desperate to achieve and are currently priced at 15/8 (skybet) to do. The oldest scorer in Premier League history at the age of 40, Teddy Sheringham was a players’ player and a managers dream. Not only was his work-rate and attitude second to none, but his ability to score all types of goals separated him from the rest. 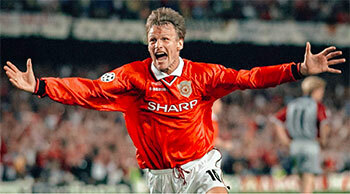 Winning the infamous treble with Manchester United was certainly a highlight for Sheringham, but he also helped the Red Devils to three league titles in four seasons at Old Trafford and earned himself the Footballer of the Year honour at the age of 34.